Holding hands with a man! Yep, I am sure that got your attention! 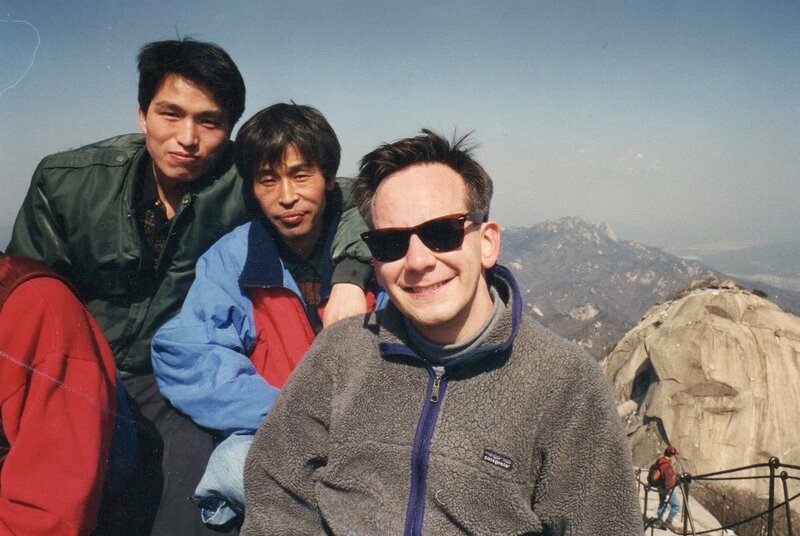 Sam (upper left) – some other guy and I on top of Pukhansan north of Seoul! 1995 Seoul, Korea and my Korean speaking ability is about five weeks old! I am teaching in Seoul and need a bank account. The new teachers have a person assigned to them to help them get socially acclimatized. My person is Sam! Sam is this gentle old soul who can never get a “real” job in Korea because he was/is a conscientious objector due to his faith as a Jehovah Witness. I respected his faith and his beliefs and we became good friends. “GOOD” as in hiking and climbing together…and he would sit and chat with me while I drank beer before class. Yes, we drank lots of beer before teaching – sue me! I asked Sam to go to the bank with me and help me establish a bank account. Kookmin Bank was about a 1/2 mile from the school and so we cruised on down to the bank. As we crossed the street, Sam reached over and grabbed my hand. Yes, I was like what the heck! We made it through the intersection and I pulled my hand back and said “Sam, dude – guys do not hold hands in America!” He was mortified to have insulted me and apologized and explained that it was very common for two men that are friends to hold hands. (Yes, this is very true – but I had not been to the park or out late – it is very common.) I told him that in America only gay (of course his English – happy) men hold hands – he said exactly – I am happy to hold your hand! I then had to explain the whole “gay” thing to him! He was again mortified and said “oh we beat them up in Korea and put them in prison!” Situation saved! He then took my arm and we walked the remaining 1/4 mile to the bank! Oh my goodness! That is so sweeet!!!! I love it. It seems so innocent and I love it! 1995 is about when I met you!!!! You connected me to a girl there named Sarah. I have her letters still but I lost touch with her as well. I always loved hearing from her. She was so sweet. I’ve seen men sleeping naked in a jjimjilbang and holding hands. It was pretty funny/sweet. Very different culture, that’s for sure.